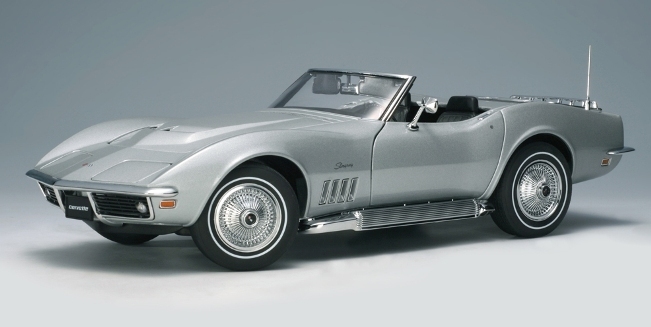 The '69 Corvette was the second year production of the C3 (third generation) Corvette, which had a life span from 1968 to 1982. Similar to the Mako Shark II concept, it had a longer, lower profile; blunter edges; long front and rear overhangs; bulging bumpers; and a low bonnet - though it kept the recessed quad headlamps and the taillights. The word "Stingray" was added to the side panels of the car and the car had integrated windshield wipers that would conceal itself when not in use. It came standard with a 300 hp "Turbo Fire 350", 350cu in (5.6-litre) V8 engine for acceleration and four discs brake for deceleration. Standard power transfer was via a floor mounted 3-speed fully synchronized transmission. The wheelbase remained the same as the C2 (1963-1967) Corvettes. 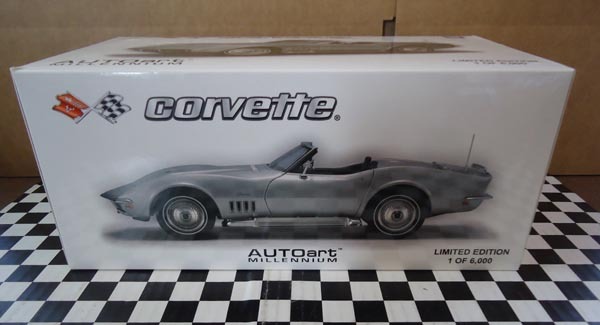 Then there were two limited ZL1 Corvette Stingray built in 1969 as well, which sported a special all aluminum L71 engine with four barrel Holley and Rochester Quadrajet Carburetors. They were estimated to produce over 500 hp making them the highest horsepower production Corvette yet; despite GM's conservative rating of only 430 hp. Besides the great muscle under the hood, the '69 Corvette proved to be a great sport car with plenty of available options to choose from: side mount exhaust, power steering, adjustable steering wheel column; a variety of gauges for communication between the car and the driver; the center console served as the command center for the heater, defroster, radio, vents, ashtray, cigarette lighter, shift lever and parking brake; behind the seats were stowage compartments for the battery, jack and tools, and personal belongings. With approximately 39,000 Corvettes produced in 1969, 57% were coupes and 43% convertibles. The convertible had a sticker price of $4,438. "No need to beware of substitutes. There aren't any." were stated in the cars brochure and that was exactly what GM had intended and accomplished for the'69 Corvette Stingray during that era. The model comes brand new in a styrofoam shell box inside a color illustrated box. 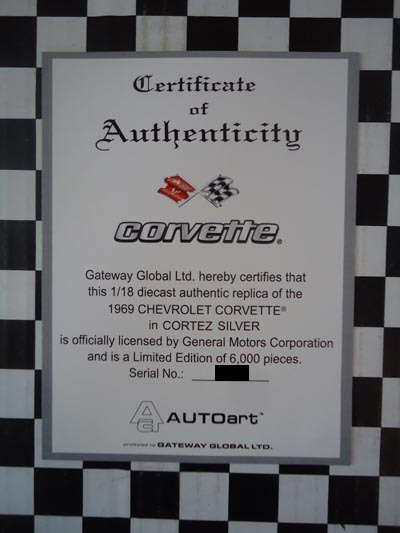 Includes a numbered Certificate of Authenticity.